The rebirth of the ancient oriental Kamado cooker. The idea is 3000 years old but The Big Green Egg is NOW! The perfect smoker AND grill AND barbecue. Meats, fish, veggies, pizza all done to perfection. Our ceramics experts have created what some call "The Ultimate Smoker", a beautiful and practical marriage of time proven cooking methods and modern technology. It is said that "Imitation is the sincerest form of flattery" and we have our imitators. 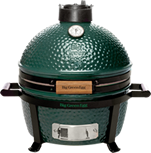 For the highest quality, kiln fired ceramic cooker available, accept no substitute, insist on the original, Big Green Egg. We`ve been doing business in the same location since 1974. 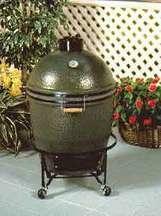 The Heavy Duty Big Green Egg is made of modern heat holding ceramics. The ceramic walls are heavy and thick. This insulating quality cooks foods with an amazingly small consumption of charcoal. A 20 LB bag of natural charcoal will usually provide four to six months use, even if you cook out several times per week. When you are through cooking, just close the lid and the top and bottom drafts to extinguish the fire. You can reuse about 80% of the charcoal. This feature alone will pay for your Big Green Egg in a short time. By adjusting the dampers, you can attain a temperature accuracy within two degrees. You have total control. You can do your grilling, barbecuing, smoking, and baking at exactly the temperatures you need. The optional heat gauge will give precise readings of temperature, from 50 to 750 degrees. We have included a cookbook with recipes and easy instructions. You`ll get great results from the start. Smoking is done at lower temperatures, usually between 150 and 250 degrees. Add some moistened wood chips to the glowing charcoal for flavor. Your Egg gives you control of the degree of smoked flavor. You can have just a hint of smoke, or have your meats smoked through to the bone. With the Big Green Egg you can smoke foods exactly the way you like them. Lighting is quick without starter fluid regardless of wind conditions. All you need are a few sheets of newspaper. The air flow works like a fireplace. The Big Green Egg will be at operating temperature and ready to use in less than ten minutes. You can use an electric lighter for even greater convenience. The BGE is a smoker, a grill, and an oven. You can do an entire meal at once by including your veggies, corn, potatoes, mushrooms, onions, etc. are superb! There are even desserts you can enjoy from the Egg. The cookbook has many more suggestions. The Big Green Egg ceramics hold heat and moisture extremely well. For this reason, foods do not dry out, as in metal charcoal, gas, or electric grills. Natural juices and flavors enhance the taste. The BGE operates without the need for water or endless hours of tending. Meats and other foods are juicier, with little or no shrinkage. The Big Green Egg is safer to use because the ceramic surface stays cooler than a metal cooker. 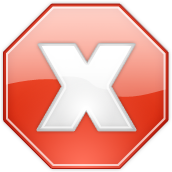 This protection is most important around small children. The ceramic Big Green Egg gives a natural and wholesome flavor to all your foods, with no metallic taste. When baking, you'll get a "brick-oven" flavor and crust. Bake a bread or a pizza in your Big Green Egg and see for yourself. You can use The Big Green Egg in all climates. Rain and snow cannot harm it. It is suitable for all year use, even in freezing temperatures. The BGE can be priceless in emergencies. The exterior has a lifetime porcelain glaze bonded to the ceramic. This permanent finish maintains its good looks and wipes clean easily. Inside, the heat will burn off any grease and splatters much like a self-cleaning oven. The porcelain coated grill is easy to clean. When your cookout is over you`ll have less than a handful of ash to remove. Heavy Duty Big Green Egg ceramics will not become brittle with use like the fire-clay kamados of old. These new space age ceramics will withstand 2000 degrees of heat without damage. Sear your steaks and fish at 700 degrees or more. Smoke your roast or ham at 200 degrees or less. Your Big Green Egg will maintain the temperature you set, and perform superbly at high and low temperatures!